Everyone from Marilyn Monroe to Khloé Kardashian has been photographed in front of it. It graced the bedroom walls of Blanche Devereaux in Golden Girls and has appeared in countless celebrity homes from Nicky Hilton’s Los Angeles dining room to Nate Berkus’s former Milan apartment. It even has its own celeb-clad Pinterest board. Yes, the Martinique wallpaper has more celebrity pedigree than any other and today, it’s getting a major rebrand. It all started in the 1940s when famed architect Paul Revere Williams was commissioned to remodel the Beverly Hills Hotel and picked the now-famous Martinique wallpaper after visiting the C.W. Stockwell showroom in Los Angeles, and the print still lives in the hotel to this day. The print saw a rebirth with the opening of Indochine in NYC’s NoHo in 1984, attracting anyone from Anna Wintour to Kate Moss, Andy Warhol, Madonna, Diane von Furstenberg, and Calvin Klein. Today, Katy Polsby, a former Serena & Lily exec, is breathing new life into C.W. Stockwell and is relaunching the Martinique wallpaper along with 13 additional prints inspired by the company’s rich archives, all in a beautiful array of vibrant hues and calm neutrals. “The collection is inspired by the rich, varied archives we rescued from the [C.W. Stockwell] warehouse on the last day before the lease expired,” explains Polsby, who grew up a few doors down from then-CEO Remy Chatain, the third-generation owner of the brand and a close family friend. The famed print itself is getting a makeover with new colorways ranging from bold turquoise hues to muted sand tones. A simplified negative of the print will also be available in two-tone palettes—but Polsby also wanted other prints to take center stage in this collection: “Given that most people’s point of entry to our brand will be Martinique, I wanted to make sure to make it obvious that it is simply one of the many amazing, unique, and thoughtful patterns in our library,” she told Domino. Today, the collection spans much further than Martinique. 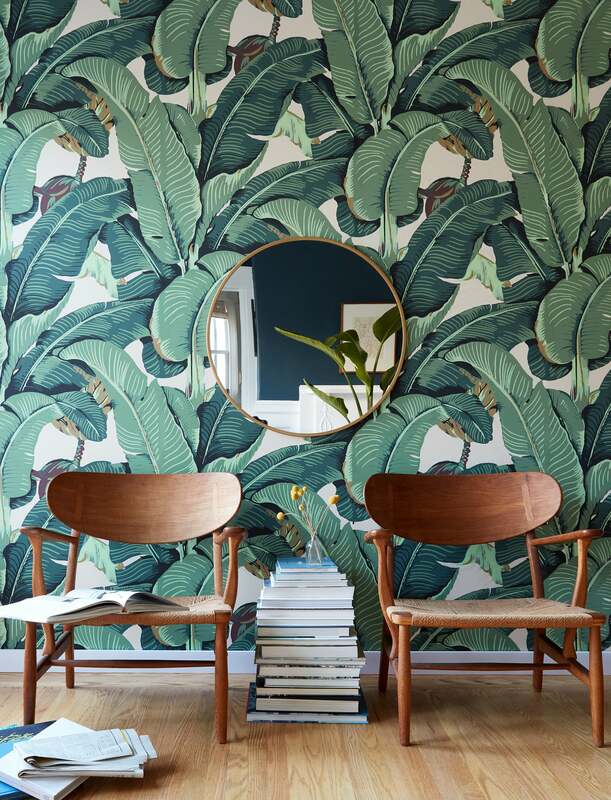 Ranging from delicate geometrics to smaller florals and bold, larger-scale patterns in shades of coral, navy, and sand, it’s poised to become the next wallpaper line to take over Hollywood. “I wanted to make sure that the collection was not entirely composed of large-scale botanical patterns and was not Martinique 115 different ways,” explains Polsby. Minimal prints like this Cabana pattern—made to evoke the sunshine peeking through a shaded cabana—pay homage to the company’s love for faraway tropical locales. “The very romantic vacation our second-generation owners, Remy Sr. and Lucile Chatain, took to the Bahamas in 1941 led to the inspiration for our signature large-scale tropical pattern that is now known far and wide,” explains Polsby. Along with the bold florals and leafy prints, an array of small geometrics speaks to the more modern and minimalist decorator, and the collection is only growing. Polsby says to expect more launches coming soon: “There is just so much I want to say using the vocabulary of the archives—the biggest challenge has been and will continue to be how to edit from the hundreds of patterns.” Certainly, this is a good start.